Welcome to the third post in our Writing Great Content series. This time, we’re going to turn our attention to your website content. Your website is your shop window on the Internet. Customers can browse and sample what you offer, and if they like what they see, they’ll buy. That’s why your website content is such a powerful weapon in your content marketing arsenal. We’ve talked in previous posts about the five Ws but for your website content, we’ll concentrate on three of those five Ws: what, who and why. People are looking for concrete information in your website content, that’s easy to absorb, and using these three Ws will help you provide that. We’ll work on the assumption that you will have five pages of content on your website, as this tends to be the norm. What website content are you going to create for each page? It’s good to create a short message for your homepage. It makes people feel welcome on your side and introduces them to your business. It also entices people to explore your website further, so you need to hit them straight away with your message. That means your what and your why. Give them a brief summary of what you offer and why you do what you do. And invite them to explore your offer further on your other web pages. Use internal links to help them navigate to specific pages too. This is the mothership page, the page which gives people the most information about your business. It covers all three of the Ws I mentioned earlier, your what, your why and your who. Tell people the reason why you set up your business, the factors that drove you to strike out into the unknown. They’ll relate to the passion and vision that drove you to set up your business. Lay out the mission for your business. Successful businesses have a clear sense of purpose, and your mission tells people what your purpose is. That sense of purpose translates into a high level of commitment to good customer service. Outline what goals you want to achieve in your business. These will help you to deliver on that mission. My mission is to help people tell stories. I have identified goals that will help me achieve that mission. I will deliver fun, interactive workshops. 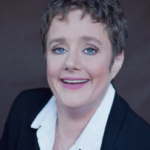 I will help people shape their stories with editing services. And I will create content that tells the story of a business in a way that delivers real results for that business. People want to know what’s in it for them. So when you’re writing about your goals, write about them in a way that shows people how you will improve their lives. For example, I tell people who are writing books that I will help them finish their stories and send it out into the world. And I tell business people that the content I write for them will help them get more customers. Sometimes, people like to give a bit of background about themselves and their team on the About Us page. This gives people an idea of how qualified you and your staff are to deliver a great service. It also gives them a glimpse of the people behind the brand. This page is all about your what. What services do you offer to make people’s lives easier? And what do you do to go the extra mile for your customers? Give an overview first, outlining all of your services. Then go into more detail about each one. Tell them what it does, the benefits it brings to people and how to avail of it. Add extra personality to your services by naming each one. In your description of your services, give people a sense of the extra things you do to deliver great service. I once had a client who dealt with a lot of older customers. They gave each one a cup of tea when they came to their showroom. And when they ordered, they sent personalised thank you notes along with their receipts. They listened carefully to them and built warm relationships with them. As a result, their website was filled with glowing testimonials from happy clients. You’ve guessed it – this page is all about your who. Sometimes, people might feel that what you offer isn’t relevant to them, so this is your chance to tell them that it is. Outline the groups of people you work with, giving a little information about their rough age group, where they live and whether they’re men or women. These customers are coming to you because they have a problem which needs to be solved. Outline what those problems are and how you solve them. This demonstrates that you understand what your clients need, and that you can meet that need. This builds their trust in you, and ultimately persuades them to buy. Once again, you’ve demonstrated the power of selling by telling. This is possibly the most crucial page of all. Now that your customer knows all about you, they need to know why they should place their trust in you. In this page, you list what makes your page special and different from all the rest. Tell them about your great customer service, the uniqueness of your offer and how reliable you are. Give case studies that demonstrate your dedication and commitment to your business. If your reasons are compelling enough, you’ll clinch the deal. 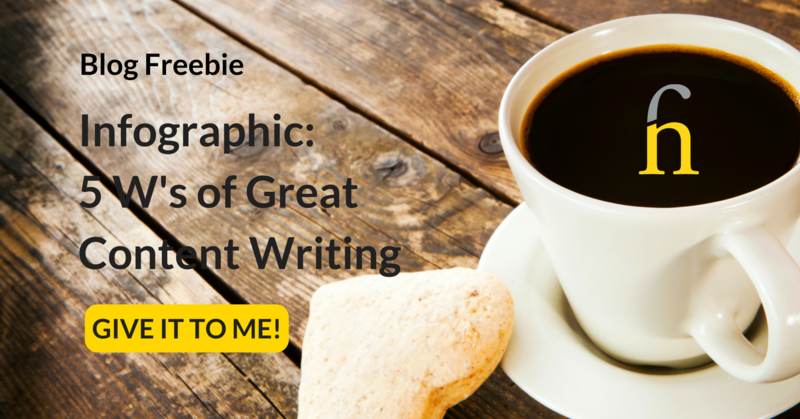 We’ve created a simple infographic to help you remember all 5 W’s for writing great content. Download it, print it or keep it handy on your desktop. So, every time you want to create a piece of great content you’ll have this simple checklist so you don’t forget any step. Stay tuned for our next post in the Great Content series. Next time, we’ll showing you how to create content for your blog, the living part of your online presence. How to Build a Great Content Writing Strategy –click here. How to Write Great Media Content – click here. 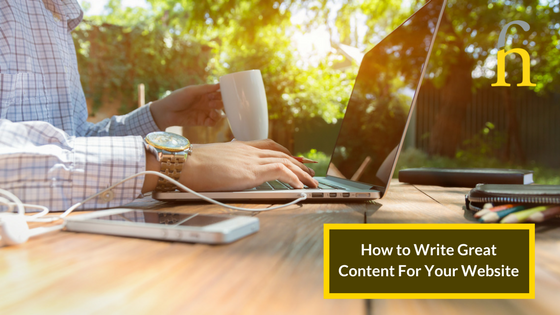 How to Write Great Content for your Website – this is it.